The Bouvier des Flandres served as a message carrier and rescue dog during World War I, during which the breed nearly became extinct! The Bouvier des Flandres are highly intelligent large dogs. They have a long coat with a rough wavy texture, a notably distinctive beard and mustache, and shaggy eyebrows. They are quick learners and respond well to consistent training. They excel as guard dogs, and can also be trained for tracking, agility, carting, schutzhund, and as a seeing eye dog. These are calm dogs with pleasant temperament, but they do need lots of human companionship. They make loyal companions and are great with children. They will need to be well socialized when young to ensure compatibility with other dogs and cats. Some may be aggressive toward other dogs. When selecting a Bouvier des Flandres, check bloodlines for hip dysplasia. This breed is also somewhat prone to eye problems. Breed Type The Bouvier des Flandres is a herding breed. Not only is it is an excellent herder, but it has done well in numerous other types of work as well. Background The Bouvier hails from the Flanders region of Europe, which includes parts of Belgium, France and the Netherlands. Thought to be a product from the crossing of the Griffon and the Beauceron, its original purpose was to serve as a cattle herder. The Bouvier also served as a message carrier and rescue dog during World War I, during which the breed nearly became extinct. Fortunately, breed loyalists kept the Bouvier going. Belgian and Dutch bloodlines of the breed are essentially the same, but Belgians tend to be slightly smaller. 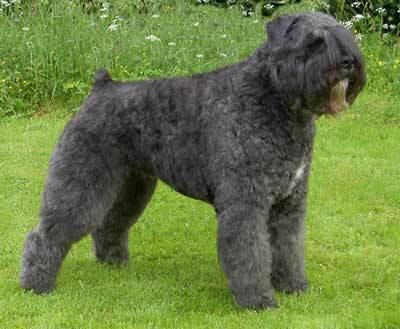 Description The Bouvier des Flandres is a large dog with a long, rough, wavy coat. It has a distinctive beard and mustache and shaggy eyebrows. Its muzzle is broad and slightly tapered, its eyes dark brown, and its nose black. Its ears are triangular, and may or may not be cropped. Colors of the Bouvier include black, fawn, blonde, gray and brindle. Blondes are born with dark hair that lightens as they age, and may not be shown. They may have a white marking on their chests. Males are 23 to 28 inches tall and weigh 75 to 90 pounds. Females are 22 to 27 inches tall and weigh 60 to 80 pounds. Care and Feeding The Bouvier des Flandres does well on a diet that includes beef, fish, brown rice and wheat. Bouviers require a substantial amount of grooming. Their coats should be brushed regularly and trimmed at least three times a year, with more frequent trimming inside the ears and on and around the feet. They should only be bathed or dry shampooed when dirty. The Bouvier's tail is usually docked where permitted at 2 to 3 days of age. Ears may or may not be cropped. Bouviers do not shed excessively, but their long coats tend to carry dirt indoors. Therefore regular cleaning is important, but not usually because of hair. Housing Your Dog The large Bouvier des Flandres needs plenty of living space. While it can thrive in an apartment or small house, it must have adequate room to run outdoors. Social Behaviors The Bouvier is a loyal companion, and is great with children. It must be well socialized, however, to ensure compatibility with other dogs and cats. Some may be aggressive toward other dogs. This breed needs lots of human companionship. Handling and Training Bouviers are quick learners. They do, however, need firm and consistent training. Dominance issues may arise if the dog is not properly trained for obedience. Activities As puppies, it is important that Bouviers not be overworked. This can cause too much stress on their growing bones, muscles and joints. A short daily walk is usually sufficient for young Bouviers. Fully grown dogs need more exercise, including longer walks and regular off-leash play sessions. Breeding/Reproduction The Bouvier has an average of eight puppies per litter. When selecting a mate for your Bouvier, make sure the prospect has been tested for hip dysplasia. Common Health Problems The Bouvier des Flandres is an overall healthy breed. It suffers from few serious health problems. Ailments to look out for include cataracts and other eye problems, and hip dysplasia. The Bouvier has a high tolerance for pain, so it can be difficult to determine the extent of any injuries it receives. Availability Bouvier des Flandres can be hard to find in many areas. If you can't find a breeder local to you, check online. Prices are usually between $600 and $1,000.